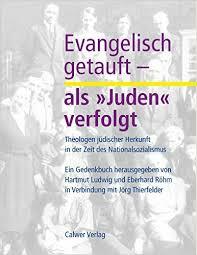 Review of Hartmut Ludwig and Eberhard Röhm, eds., with Jörg Thierfelder, Evangelisch getauft—als “Juden” verfolgt: Theologen jüdischer Herkunft in der Zeit des Nationalsozialismus (Stuttgart: Calwer Verlag, 2014). 473 pages, with illustrations. ISBN: 9783766842992. The history of “non-Aryan Christians” under National Socialism has been a peripheral issue in much of the historiography and a notoriously fuzzy one even in works that focus on the German churches, reflecting the ambiguities of the category itself as well as the unpredictable fates of those who were so labelled. In Nazi Germany the term “non-Aryan” was often used interchangeably with “Jew,” yet for many Germans there was a distinction. Jews had been persecuted throughout European history, but the Emancipation laws of the nineteenth century opened the way to greater opportunity and assimilation, often but not only through conversion to Christianity. For some, the decision to assimilate through conversion was a pragmatic one, made in the belief that it would lead to a better career and firmer standing in German society; for others, it was made for reasons of marriage or conviction. In any case, it was a double-edged sword, creating a dividing line in German society that became very evident after 1933. Christians of Jewish ancestry did not think of themselves as Jews and were not viewed as such by religiously observant Jews, and many of these Christians shared the antisemitism of the times. After 1933, however, Nazi law designated anyone with Jewish ancestry as “non-Aryan,” blending the religious and racialized categories, and as a result many baptized Christians suddenly found themselves categorized as Judenchristen, Nichtarier, or nichtarische Christen. Estimates of the number of people who fell into this category under Nazi law vary. This volume gives the total figure as around 400,000 (a figure that includes members of Christian churches as well as secular Germans with some Jewish ancestry). A 1945 World Council of Churches publication that quoted German governmental figures from 1933 put the number at 250,000 (and the number of religiously observant or secular Jews at 550,000), but some ecumenical leaders in the U.S. and Europe who were involved in refugee work in the 1930s gave numbers as high as one and a half million—based, I suspect, on the total numbers of refugees (not just Christians) that these organizations sought to assist. The Nazi regime began to pass anti-Jewish laws immediately. The two major 1933 laws—the April 1, 1933, “Law for the Restoration of the Professional Civil Service” and the September 1933 law dis-barring “non-Aryan” lawyers—had sweeping effects. In both instances, there were exemptions for Jewish veterans of the First World War as well as for people who had been practicing law or serving in the civil service as of August 1, 1914, and throughout 1933 and 1934 these laws were irregularly implemented, particularly where so-called Mischlinge, or Germans of partial Jewish ancestry, were concerned. It wasn’t really until the 1935 Nuremberg laws that the categories and degrees of “racial Jewishness” were legally defined. In the instance of the April 1 law there was another important exemption, elucidated in the May 6 Reichsgesetzblatt: the churches. The April 1 law essentially left the implementation of the law up to the regional and provincial church governments, and in the case of the Protestant churches, of course, the German Christian Movement was eager to introduce a church version of the Aryan paragraph throughout Germany. Their attempts to do so sparked the widespread theological and ecclesial debate that culminated in the Protestant Kirchenkampf. As opponents of the Aryan paragraph argued, it directly contradicted church teachings on universal salvation, baptism, conversion, and ordination. There were of course other church teachings, such as the centrality of love for one’s neighbor, that should have led to a broader solidarity with everyone persecuted under the Nazi regime, but for the most part Protestant and Catholic churches in Germany drew a clear distinction between secular and religiously observant Jews on the one hand, and baptized Christians who fell under the Nazi racial laws on the other. Solidarity with the former group was virtually non-existent (on the contrary, Protestant leaders like Otto Dibelius rushed to justify the Nazi anti-Jewish measures). Concerns for the latter group proved to be erratic and short-lived, as the initial controversies about the Aryan paragraph dissipated and support for those affected crumbled under internal and external pressures. Evangelisch getauft—als “Juden” verfolgt is not a comprehensive history of this topic; nonetheless it is a valuable contribution to the literature. As its subtitle indicates, it is primarily a Gedenkbuch with brief biographies of 180 German Protestants whose lives were changed by the racial laws and the responses of their church. The editors have cast a wide net. The individuals profiled here include not only theologians and members of the Christian clergy, but individuals who were barred from studying theology before 1945 and others who, barred from other professions, decided to study theology in exile. Also included are teachers of religious education, Christians in “mixed” marriages, Austrians who came under Nazi law after 1938, and even several individuals who were Deutsche Christen or members of the Nazi party. While most of those profiled were members of the German Evangelical Church, there are also several profiles of individuals from Methodist, Baptist, and other free churches. The editors’ introduction is an admirably clear overview of the subject, portraying the complexities of the Nazi laws and the gradual intensification of pressures on these individuals, and concluding with a brief but devastating portrait of the churches’ responses up to and after 1945. There are several very useful appendixes, including a table that locates these individuals by Landeskirche and “racial” category as defined by the 1935 Nuremberg laws, a bibliography organized by name that gives the sources for the information about each individual, and an extensive bibliography of the relevant literature. An additional appendix is a compilation of all the various measures against each individual as well as their fates and subsequent careers—a listing that gives a poignant overview of the numerous ways in which many of these people suffered. Pastors and teachers were forced into retirement, spouses were publicly humiliated, anonymous threats were sent. A number of people were betrayed by colleagues; some were sent to prisons, concentration camps, or forced labor. Some found safety for a time in one of the Confessing Church institutions. Most of them emigrated and many—though not all—remained abroad after 1945. Those who returned encountered a mixed reception by church leaders and had to wage legal and procedural battles in some instances in order to re-enter their careers. Several people briefly returned to Germany before deciding to leave again. The 180 biographical studies, written by a number of clergy and scholars, comprise the heart of the book. By extending their study beyond the names of the clergy already known from the literature on the Kirchenkampf, the authors and editors demonstrate the diversity of this sector of the population and have included many women in their profiles, which gives a portrait of the gendered dynamics surrounding the issue. While some of these individuals were familiar names from existing studies of the Confessing church and the Gruber office, there were a number of individuals that I hadn’t realized were affected by the racial laws and there were other names that were completely new to me. There are a number of individuals from “brown” regional churches, and the accounts of their experiences offer important information about how the actions of church leadership in those regions affected both opposition voices and “non-Aryan” Christians. While some of these people found refuge and solidarity in the Confessing Church, for examples, others found it lamentably passive and silent. Ernst Althausen, the Russian-born grandson of an Orthodox rabbi, worked in the interwar period with ethnic German refugees in the east, leading him to study theology in Berlin. He joined the Pastors Emergency League but complained to Martin Niemoeller that it wasn’t enough to stand up to the German Christians. Althausen worked for the Berlin Judenmission and came under pressure from the Nazi party and the church alike. After he had to wear the yellow star in 1941 his Confessing Church colleagues in Berlin stopped allowing him to hold church services and (at the age of 80), he was banned from public speaking. The stories of “non-Aryan Christians” who were either sympathetic to Nazism or married to such people are particularly striking. Pastor Georg Börner, a supporter of the Deutsche Christen and the Nazi Party, didn’t join either organization only because his wife was one of the daughters of Kurt Eisner, the Jewish social democrat who was assassinated after leading the 1919 German revolution in Bavaria. Throughout the 1930s Börner was publicly attacked in Der Stürmer and the SS Schwarze Korps, but Nazi party members in his parish defended him, Bishop Hans Meiser stood behind him, and during the war the Bavarian governmental president issued a special order permitting him to stay in his pastorate. His wife remained unscathed, and after 1945 the Börners remained in their parish until his retirement in 1968. One pastor who did become a member of the Deutsche Christen as well as the Nazi Party was Hellmut Fischer, who successfully hid the fact that he had a Jewish grandmother until 1938, when the Bavarian government decided to require Aryan certificates for clergy. Fischer quietly requested to be transferred to a non-pastoral position, but in December 1938 Landeskirche officials told Fischer he would have to leave the ministry. His parish council stood up for him, declaring that he was a good pastor and “politically reliable.” The outbreak of the war resolved things: Fischer was drafted, the Landeskirche tabled the proceedings against him, and he was able to return to a parish after the war in Würzburg. As these examples illustrate, many of these people are so interesting and surprising that readers will be tempted to do additional research (I found myself wondering, for example, where Eisner’s daughter stood politically in all this, and what happened to Eisner’s other children). The volume as a whole illustrates that those designated as “non-Aryan” Christian represented a broad spectrum of backgrounds and theological and political perspectives. As such it is a major contribution to our understanding of the complexity of the issue. The range of Germans affected by the Nazi racial laws was wide and their fates varied widely. Some people came under immediate pressure in 1933; others retained their positions until the late 1930s. Some of the people portrayed here moved toward a broader solidarity and engagement on behalf of all persecuted Jews, in contrast to the rest of their church. And, as the editors note in the introduction, the stories of these individuals attest to the widespread antisemitism not only during the Nazi era but afterward, when some of them continued to suffer under their church leadership and the antisemitism of friends and colleagues.